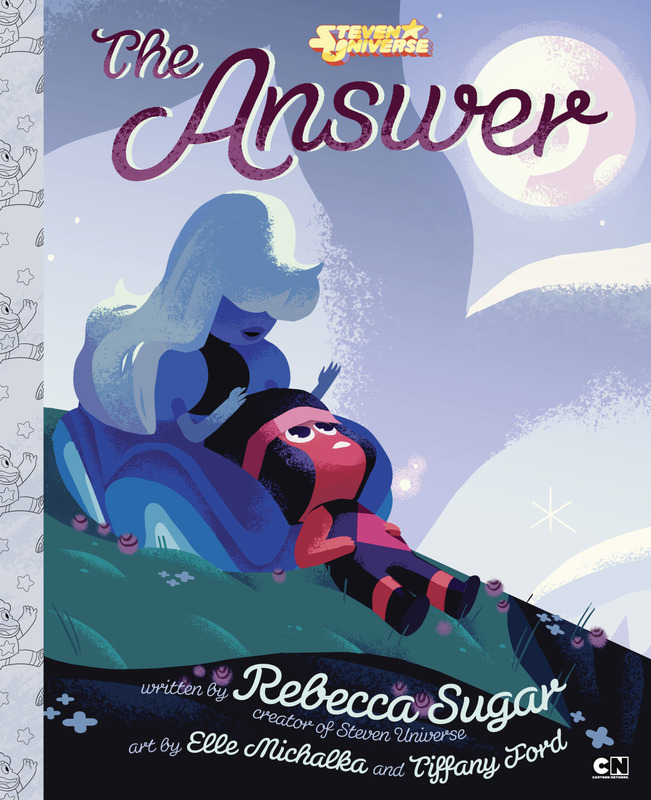 The Answer Is Love: Steven Universe Comes Out With Queer Children's Book! Steven Universe creator Rebecca Sugar‘s not satisfied with having merely made the most progressive cartoon ever. Thankfully, Sugar’s working to make the world of children’s books more inclusive too! September 6 saw the release of The Answer, the first Steven Universe storybook. The Answer, made to look like a Little Golden Book, is based on the episode of the same name. We’re gonna get a little bit into spoiler territory; if you’ve not caught up to at least that episode… There have been 37 episodes since then! You’re missing out! Anyway — The Answer tells the love story of Ruby and Sapphire. Over 5000 years ago, near the beginning of the Earth/Homeworld war, Sapphire, an upper-echelon gem who can see the future, is sent to Earth. Ruby is sent, along with two other almost-identical Rubies, to protect her. Sapphire’s ability to see the future shows her a fight that will end the war with the Crystal Gems. Unfortunately, that fight also destroys Sapphire. Seeing an immovable future, she’d come to terms with her upcoming death. Sure enough, the Crystal Gems — then just Rose Quartz and Pearl — show up as foretold. The fight progresses exactly as Sapphire predicted — except for one thing. Ruby, acting impulsively on a comment Sapphire makes about her impending death, saves her… by fusing into Garnet. Garnet’s existence disgusts the other Homeworld Gems. They’d never seen two non-identical gems had fused. The low-class Ruby was to be destroyed for her transgression — but Sapphire and Ruby escape and become exiles on Earth. As they examine their situation, they realize the future is a collection of possibilities rather than something written in stone. They also realize they’ve fallen in love with each other. The two — now one, by choice this time — meet up with the Crystal Gems. Rose Quartz helps Garnet realize she’s the answer to all her questions: Love. A two-page spread from The Answer, written by Rebecca Sugar, illustrated by Elle Michalka and Tiffany Ford. The book’s not content merely to be a re-telling of the episode — instead, it plays with form to comment on the original story. The storybook’s pages are letterboxed with Sapphire and Ruby commenting on the story. As the book progresses, the two Gems realize they don’t need to stay in their separate, defined roles. But for a girl having feelings for other girls, there was a deafening silence. There was nothing to say, ‘This feeling you’re having for this girl, this is a love feeling.’ And if you ask someone, ‘Does this mean something?’ suddenly that answer for you is in the hands of someone else… Or maybe you don’t even think to ask, and by the time you figure it out, you’ve already learned that these feelings you’re having are not appropriate, instead of being encouraged throughout your childhood to think about your own feelings and enjoy them. Steven Universe is a great step in getting kids to understand and think about their own feelings. In fact, the recent episode “Mindful Education” was about just that — instead of bottling up bad thoughts, Steven and Connie learn to engage with them. Emotionally intelligent shows like this and Adventure Time make us excited about the next generation.